Charming. It’s a word that is often heard in travel circles when describing a destination. And yet, as Henk and I explored the treed streets of old town Alexandria in Northern Virginia, it was the only word that repeatedly kept coming to mind. 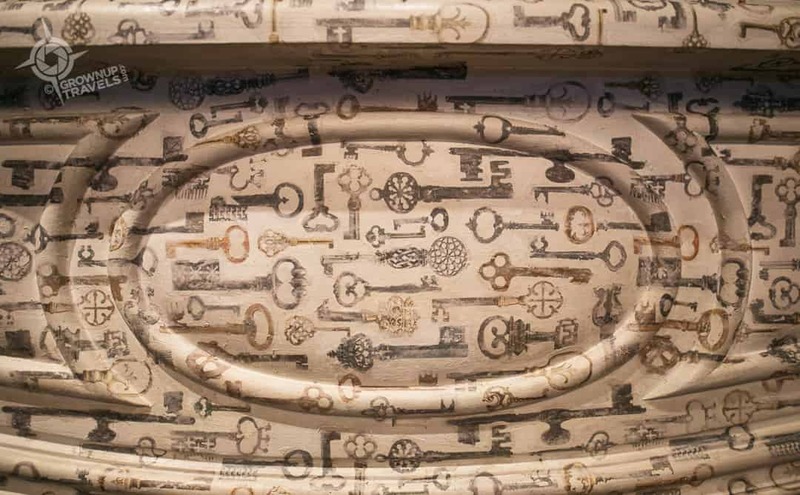 Not just because the centre of the town boasts cobblestoned alleys, boutique hotels, and historic architecture, but because of quirky details that give it a personality all its own. We can honestly say we were caught in the spell of this pretty town (and not just because we visited close to Halloween!) 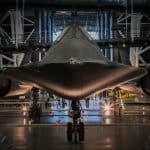 I think you will be enchanted too, when you check out these unique things to do in old town Alexandria, Virginia. 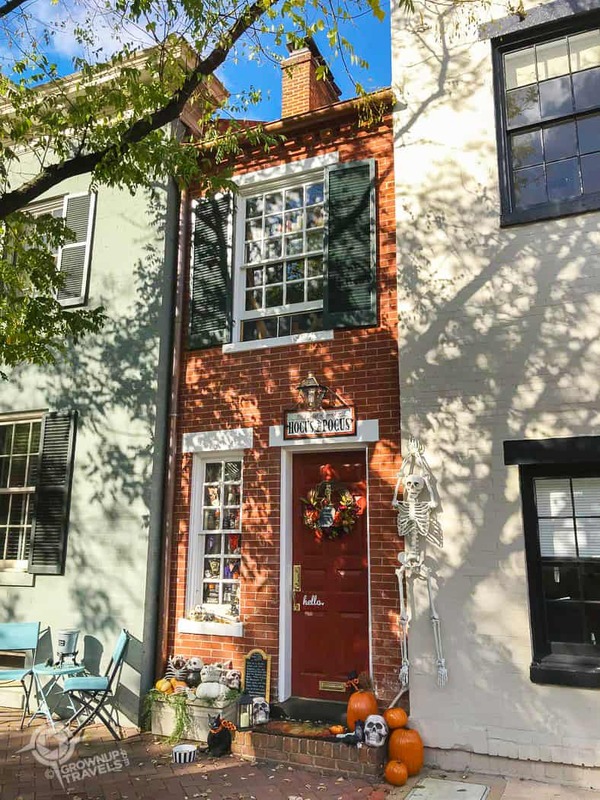 Architecturally, almost every street you stroll in old town Alexandria holds something of interest, whether it be Federalist row houses with colourful, shuttered front doors or rental properties once owned by George Washington. 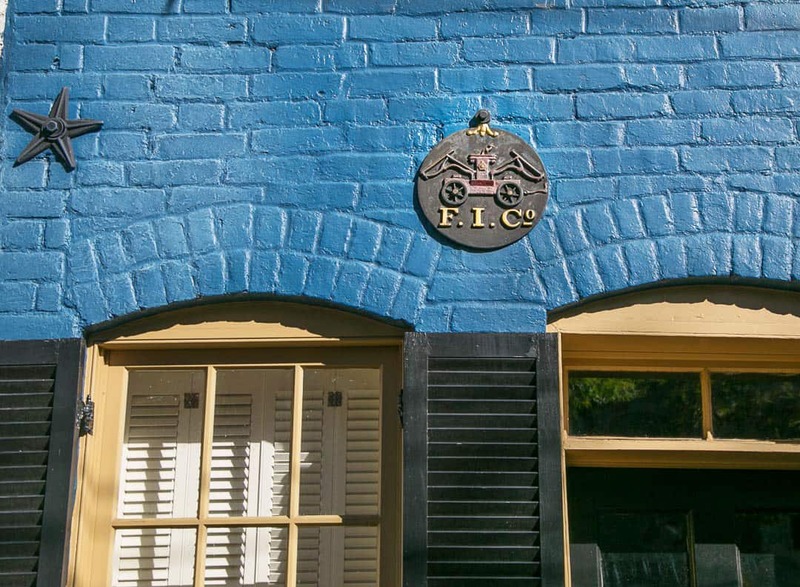 Some of these homes and businesses date back to the time of the American Revolution, many others from the 19th and early 20th century and it’s interesting to see their unique architectural details. 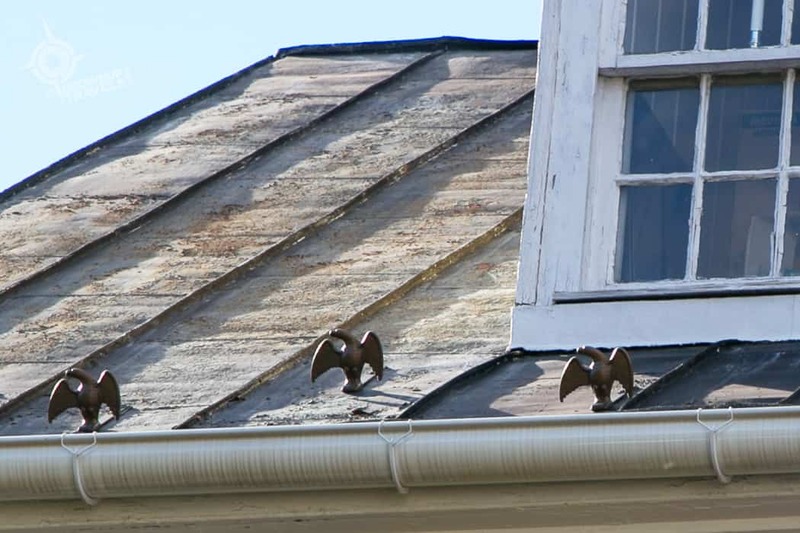 Look up for example, and you’ll find metal ‘eagles’ perched on the steeply pitched roofs that are there to break up ice dams so they don’t fall to the street and injure pedestrians. The metal stars are not just decorative, they are actually the ends of wrought-iron bars that support the interior structure of the homes. There are also different plaques with imagery that relates to fire fighting which are believed to be mini advertisements for the insurance company that protected that home. 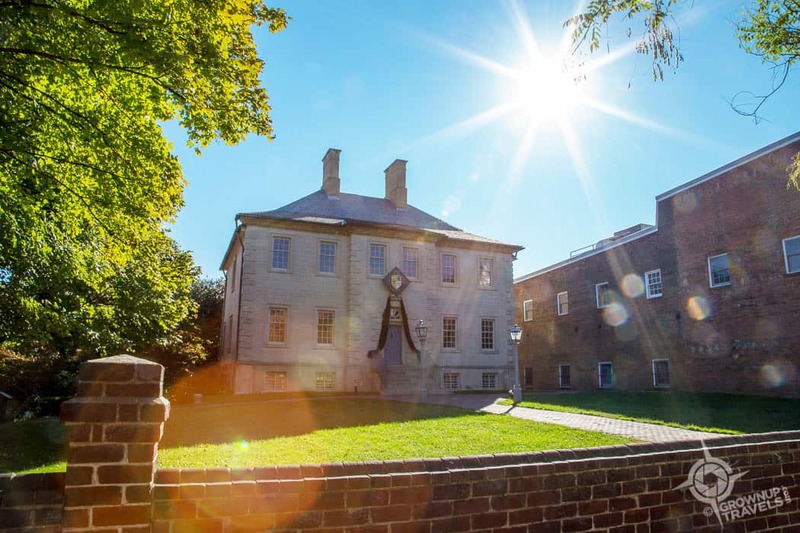 One of the most important historic homes in Alexandria is the Carlyle House, completed in 1753 by Scottish merchant John Carlyle. 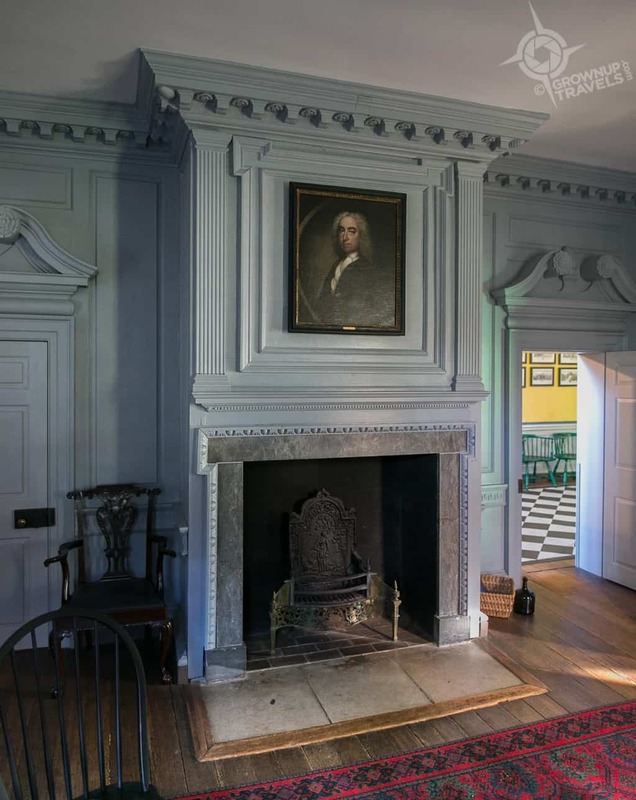 At the time it was built, the house was one of the most luxurious in town, and overlooked the Potomac river below, allowing Carlyle to supervise the delivery of goods to his property. 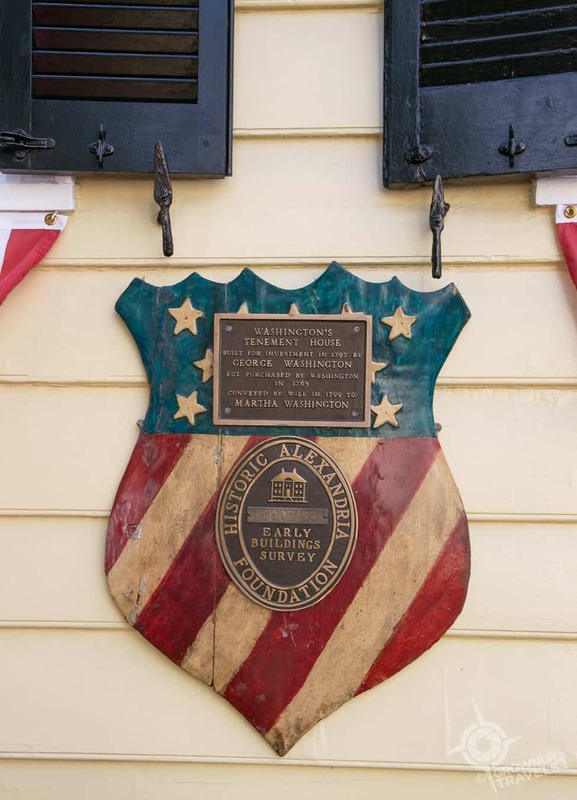 The home also served as the headquarters for the English General Edward Braddock during the French and Indian War in 1755, and more than 100 years later as a hospital to treat wounded after the first major battle of the Civil War at Bull Run. 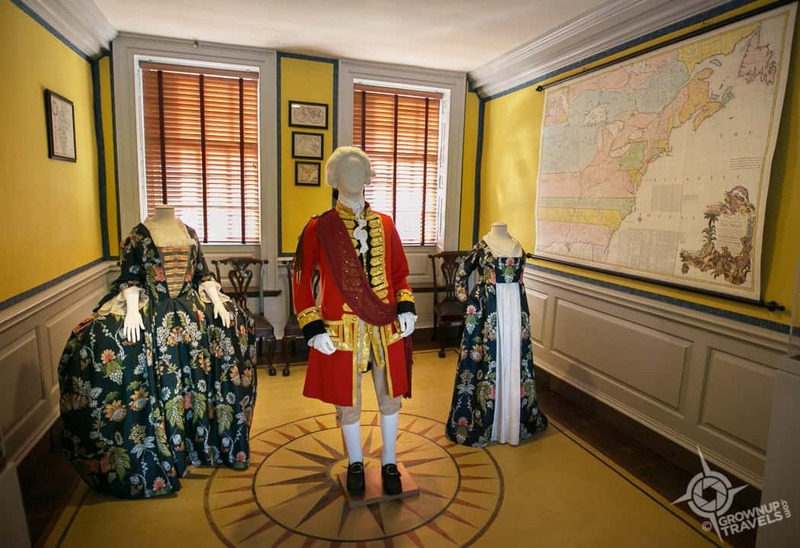 Apart from its role in politics and history, a visit to Carlyle House can also give you a sense of how the upper class really lived during the late 1700s. At the same time that newly arrived immigrants were battling the elements and taming the wilderness as homesteaders, there were also important members of society who enjoyed the finer things in life in established towns like Alexandria. 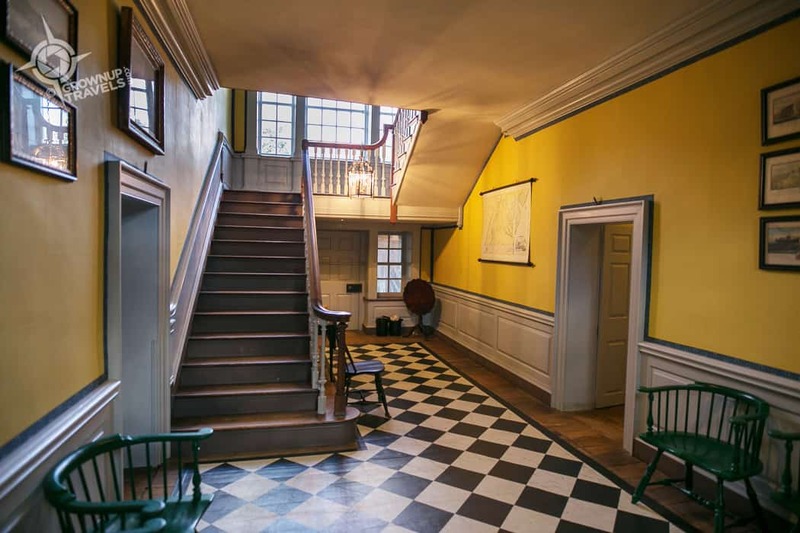 The interior of the home reflects this time period, with furnishings and decor that are historically accurate, including painted oilcloths on the floors like this one in the foyer. What I found particularly interesting was a display of mannequins showing the clothing of the different eras: the left mannequin wears a reproduction of the actual floral pattern on the wedding dress worn by Sarah Fairfax, Carlyle’s bride when they wed in 1747; the male figure sports a British colonial uniform; and the mannequin on the right wears Carlyle’s daughter’s wedding dress – his daughter used her mother’s original dress and redesigned it in the ‘modern’ style of her day. 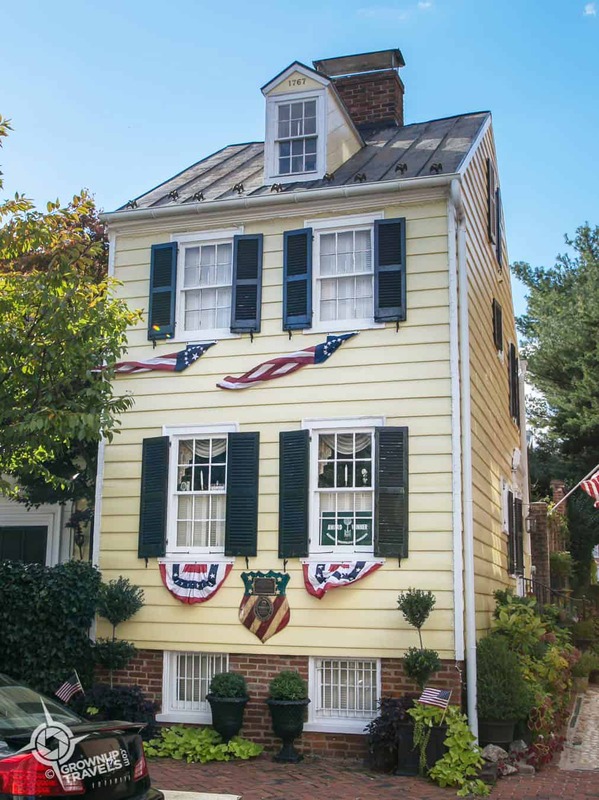 From the sublime to the ridiculous: while Carlyle House may represent one of Alexandria’s most elegant historic properties, there is one in town that might be its quirkiest: ‘America’s skinniest house’, the Spite House, barely 7 feet wide. The Spite House was actually an infill home built in 1830 in an alleyway on Queen Street: the adjacent building’s owner was frustrated by people using the laneway beside it to loiter or park their wagons, so he decided to build a wall-to-wall house there instead to spite them (hence the name). 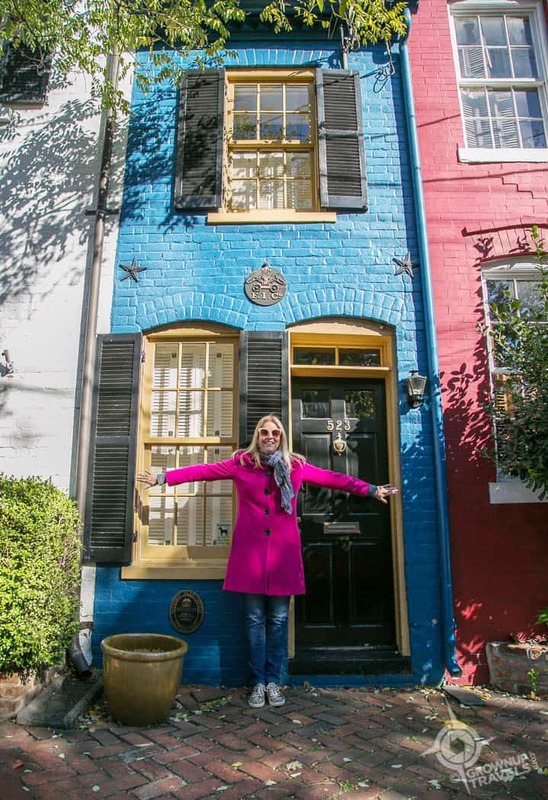 But did you know there’s another skinny home in Alexandria that’s almost as narrow? 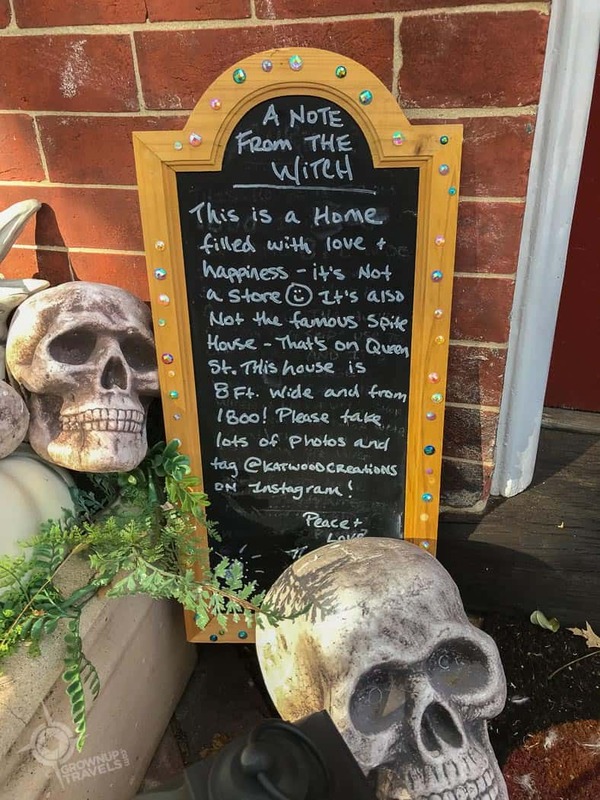 Henk and I stumbled on this second, 8-foot wide house on Prince Street, all decked out for Halloween by the owner who is a quirky fibre artist herself and obviously has an appreciation for whimsy. And despite being the owner of Alexandria’s second narrowest house and not holding the title of skinniest house in America, she doesn’t seem to hold a grudge! 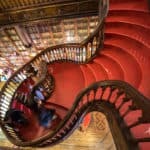 If you’re a fan of Outlander (like I am) or of Harry Potter, there are even themed tours that point out various herbs and medicines that readers will recognize from their mention in these novels, including exotics like Dragon’s Blood and extractions derived from the Unicorn plant. 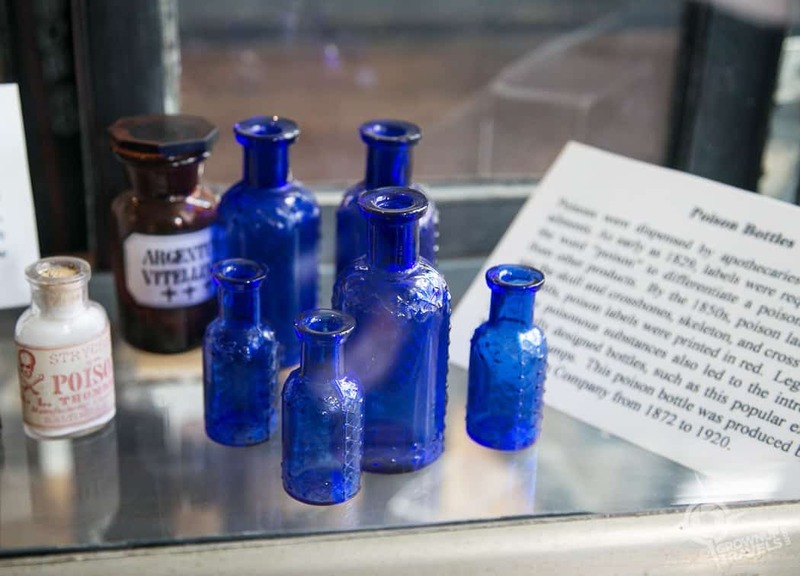 On the main floor there are artefacts from the early days of pharmacology, like poison bottles which were typically contained in darker bottles. 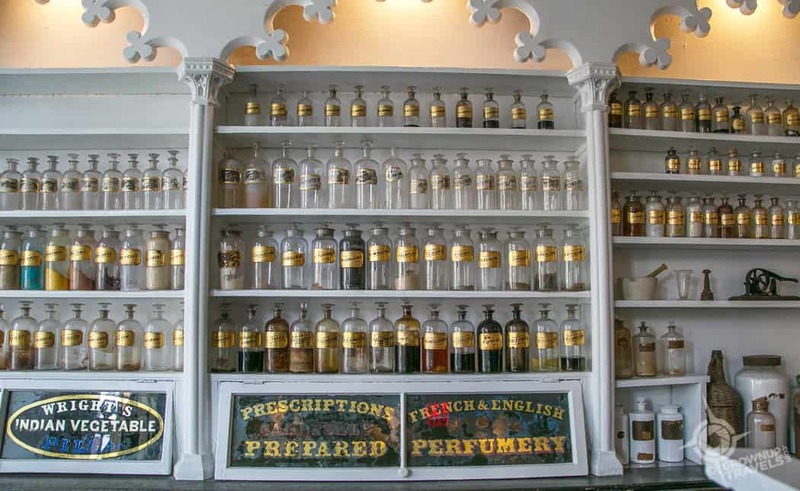 Alexandria prides itself on its unique boutiques, and the fact that local businesses, not big retail chains, dominate the historic centre. King Street, which runs down to the waterfront is the main street and perfect for window shopping, but be sure to go down the smaller side streets where you’ll find more cute retailers, coffee shops, and maybe even an artistic take on a garage door! 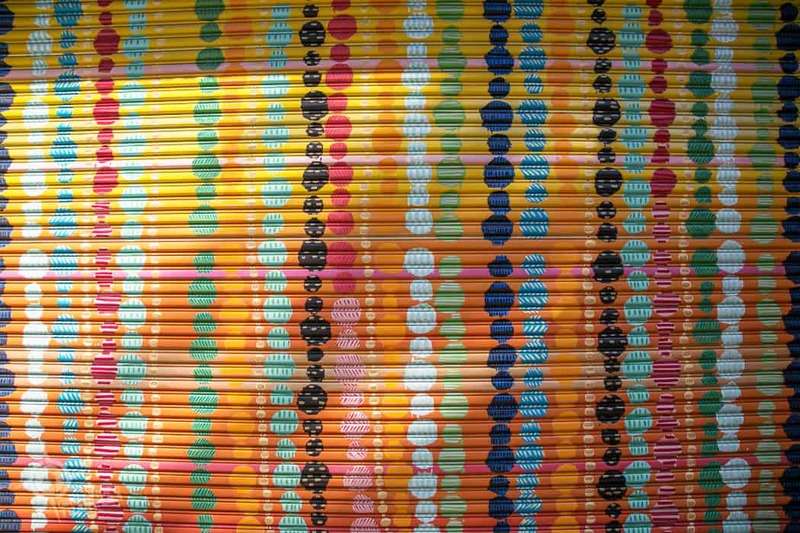 This is a pretty painted garage door we spotted on a side street in Alexandria. 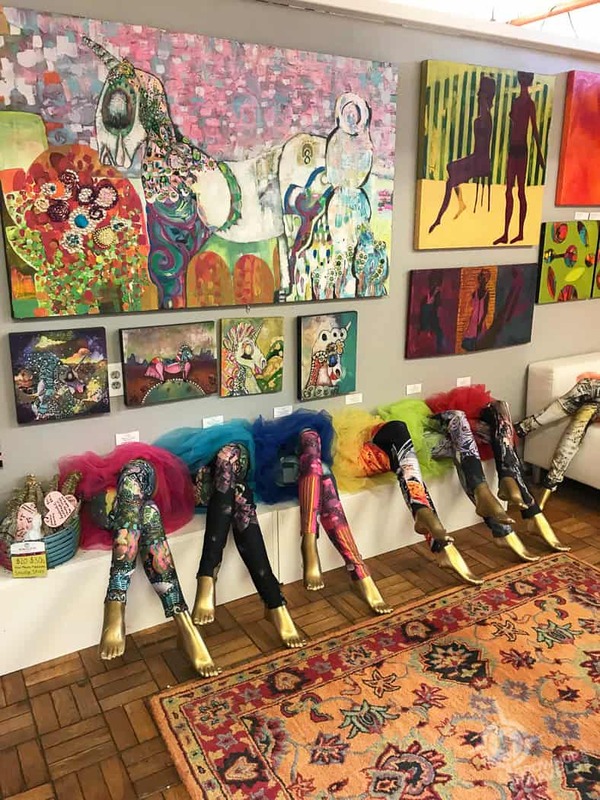 If you are looking for original art that isn’t on garage doors, the waterfront is where you’ll find the Torpedo Factory Art Center, a converted munitions building that now offers studio and retail space to 165 working artists and artisans. 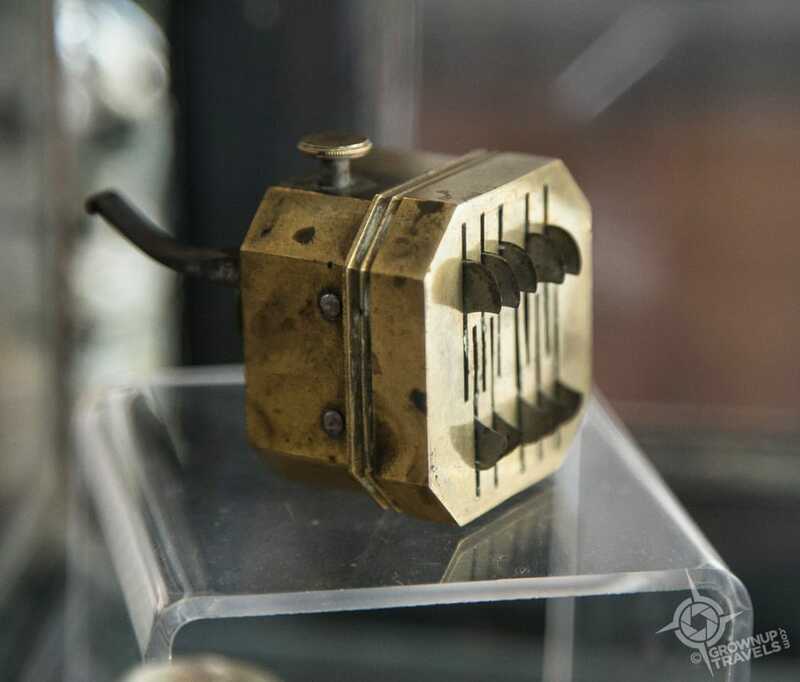 Everything here is original, so if you are looking for unique pieces for yourself or someone else, this is THE place to find them and you often get to meet the artists who made them. 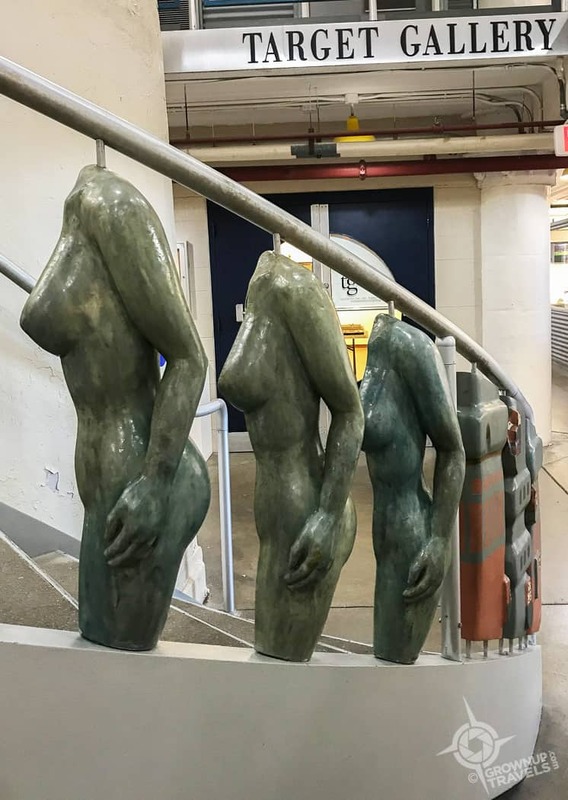 Alexandria’s waterfront has seen some significant development recently to complement the Torpedo Factory Art Centre, all of which have made this area a vibrant place for locals and visitors alike. 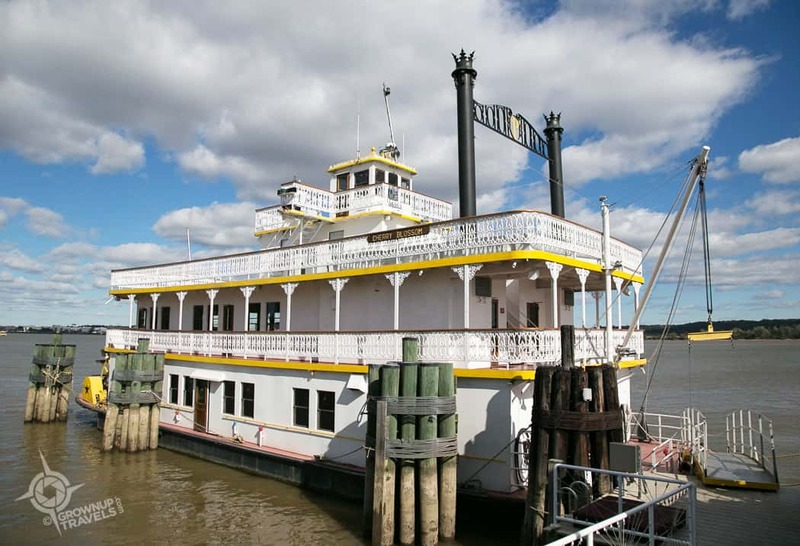 A new boutique hotel, waterfront restaurants with outdoor patios and of course a pretty marina that offers boat tours on the Potomac are some of the attractions that bring people here. Not to mention enjoying great views across the river to Washington, all while enjoying a glass of your favourite beverage. A favourite beverage, you say? 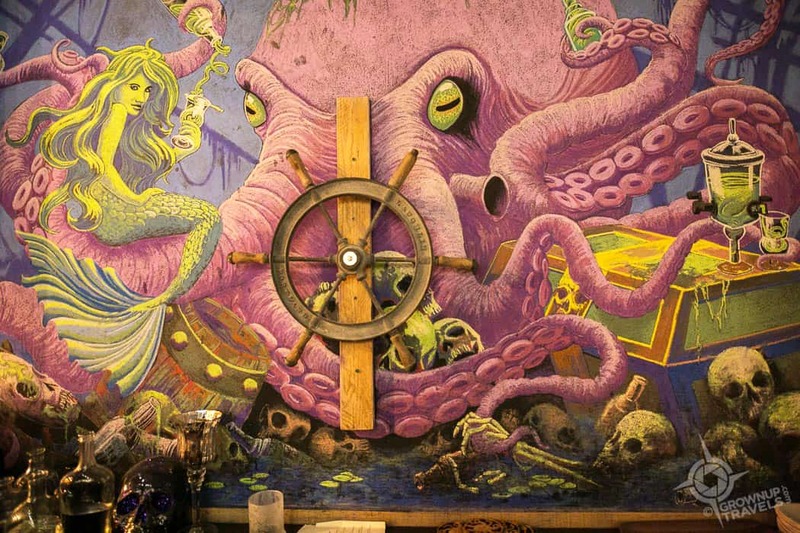 Then you’ll DEFINITELY want to hit up one of Alexandria’s cool speakeasies. Henk and I love to check out these secret little hideaways when we visit cities (even if they aren’t all that secret anymore) and we chose Captain Gregory’s for our late evening libations. 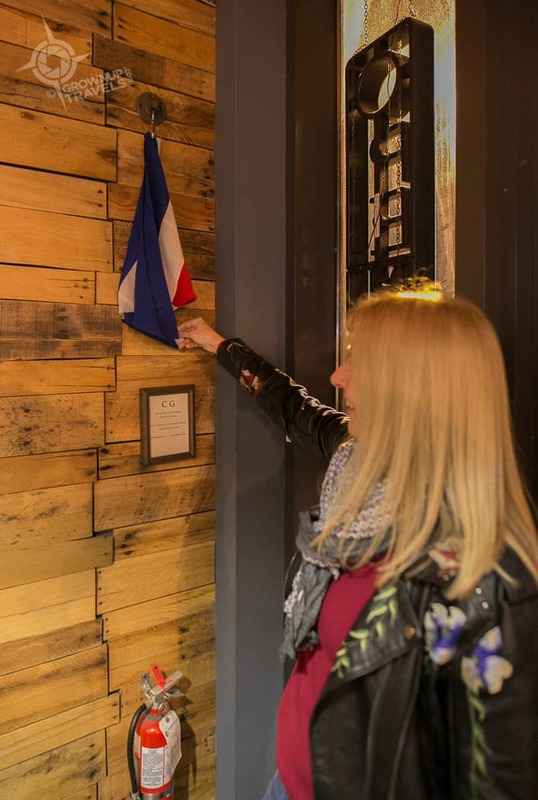 Hidden behind a camouflaged entrance of reclaimed wood panels in the entrance to Sugar Shack Donuts on North Henry Street, guests pull the flag down to get ushered into a cozy room with several tables and a small bar. The bar menu includes classic cocktails of course, but the bartender likes to shake it up a bit, literally, with Experimental Sunday concoctions. 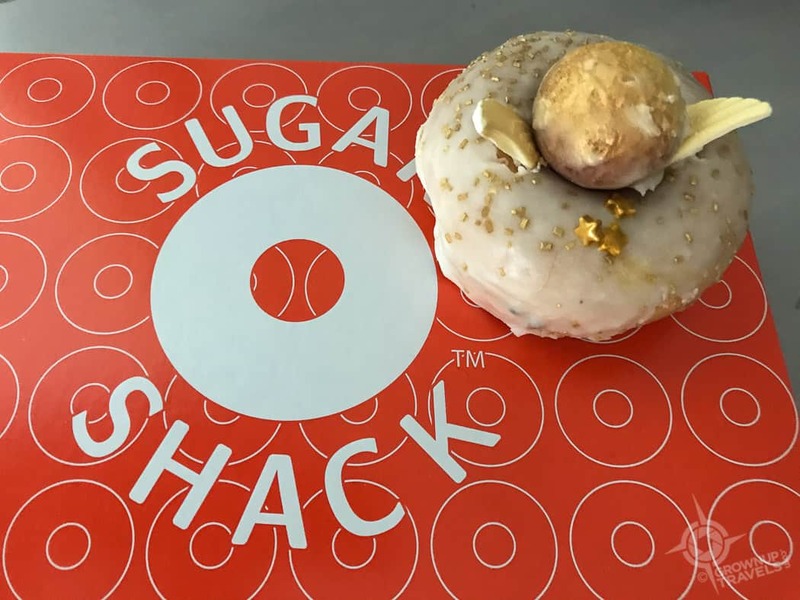 The Sugar Shack really is a fully operational donut shop, too. 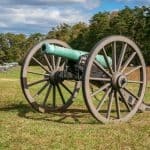 A town that is as unique and boutique as Alexandria warrants a stay at a similar type of property. 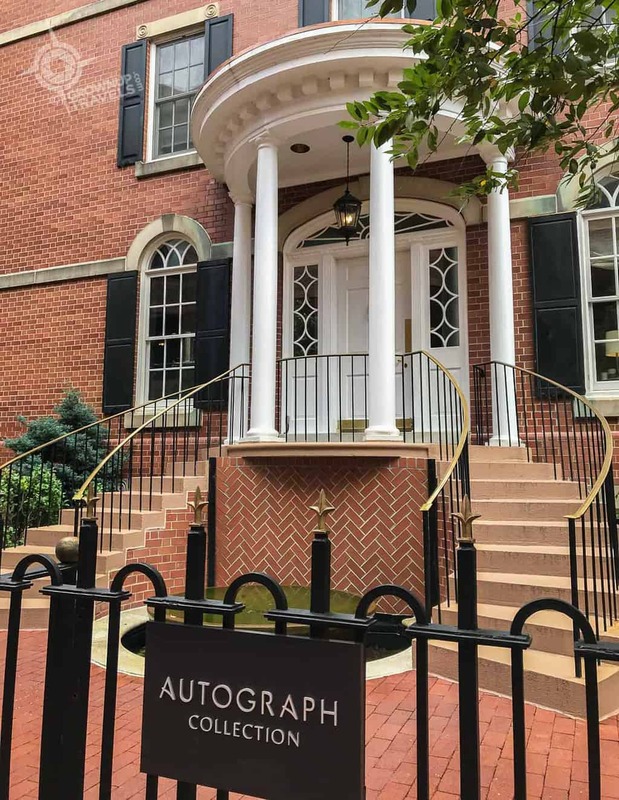 Fortunately, old town Alexandria has several properties that fit the bill, including two in the Autograph Collection by Marriott. Don’t be confused by the familiar Marriott name, though: these hotels are anything but cookie-cutter. 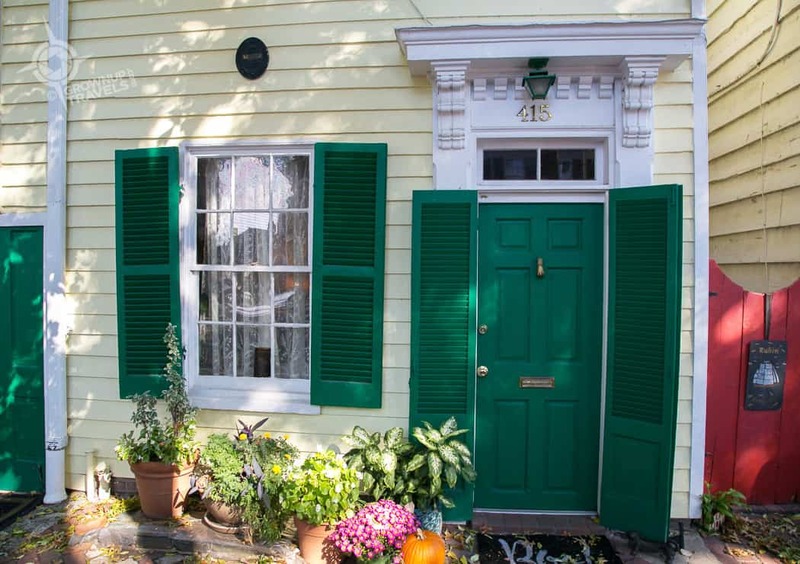 The larger of these two properties, the Alexandrian is located right on King Street on what was once the Civil War-era homestead of the city’s founders, John and Philip Alexander. It definitely qualifies as unique with its vibrant, colourful lobby that hit my sweet spot with its quirky decor and blend of modern/funky furnishings with historic details. 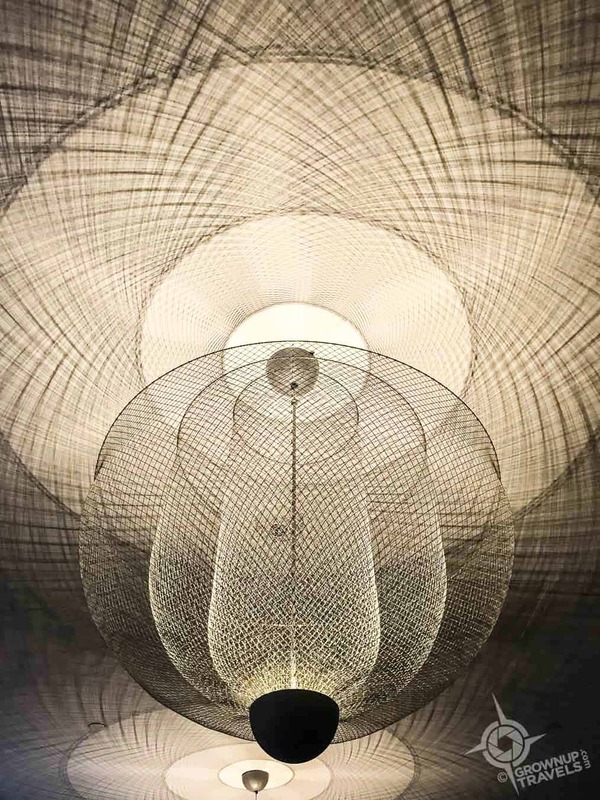 Henk and I stayed at the smaller, even more boutique Morrison House, a 4-diamond, 45-room property located a block away from King Street, that offers an intimate, upscale experience for its guests. 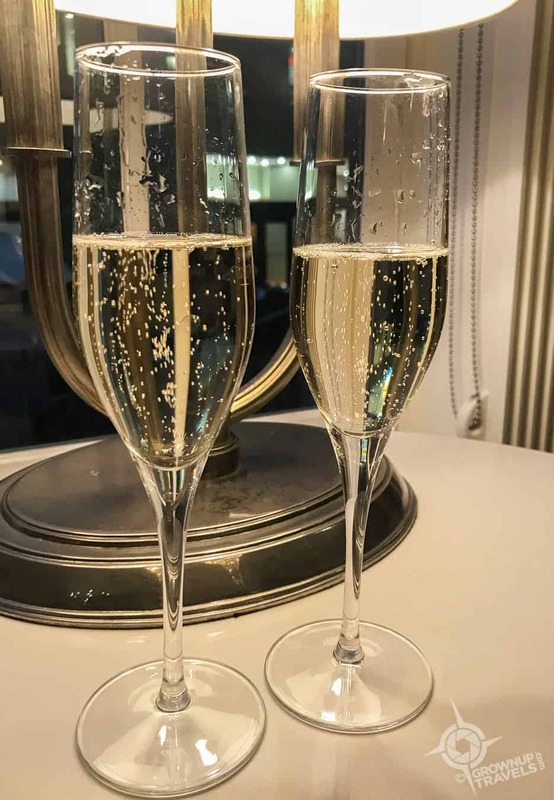 Little luxuries and unexpected surprises (like some sparkling wine that was offered to us one afternoon ‘just because’) characterize the experience that guests can enjoy here. Bubbly was served ‘just because’ one afternoon at the Morrison House. 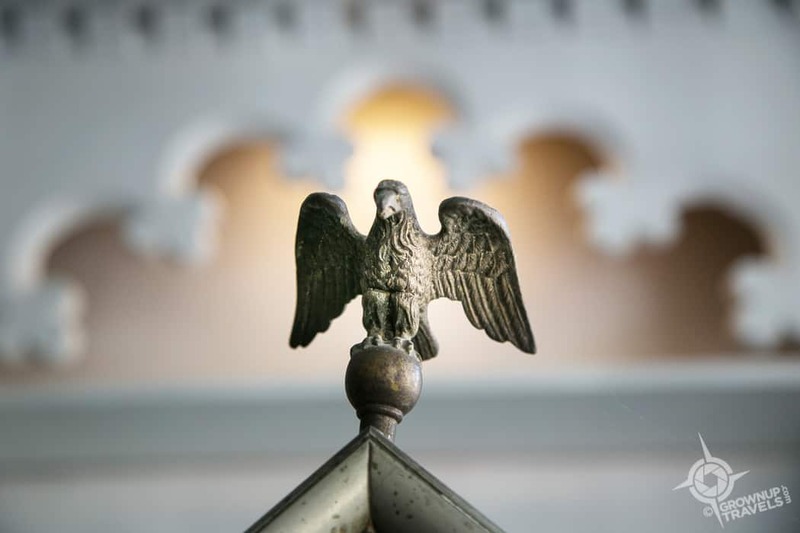 And with its Federalist architecture and well-appointed rooms, the Morrison feels a little bit like the larger, ‘Whiter’ house across the river! 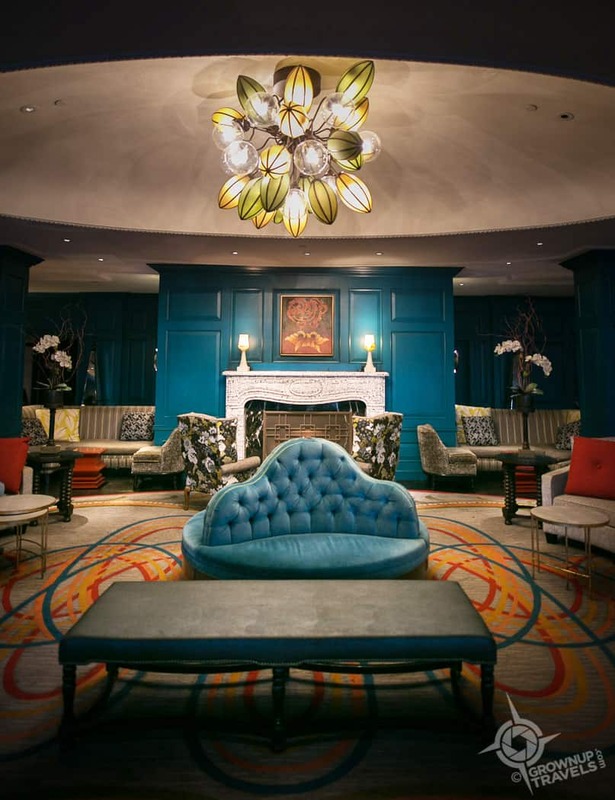 TIP: Washington DC is literally a 25 minute Metro ride away from Alexandria, so why not stay in a boutique hotel here and do day trips to the capital? 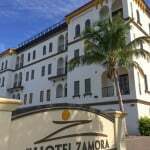 You’ll save significantly on your hotel rate, not have to worry about parking, and you get to enjoy a much more relaxed ambience! 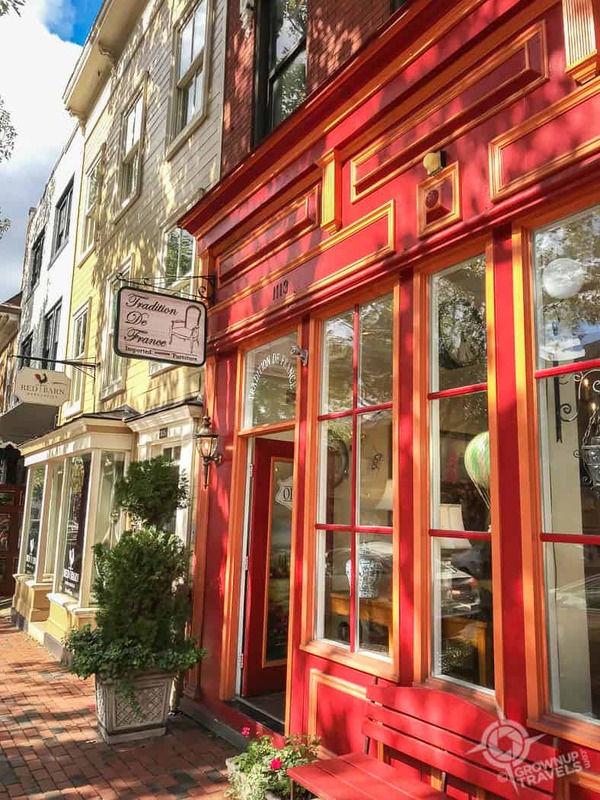 If anyone has been keeping Alexandria in their back pocket as one of the prettiest cities in the US to visit, their secret is out; Condé Nast recently voted Alexandria as the #4 Best Small City in the U.S. so you can expect more people are going to putting this Northern Virginia town on their radar. Maybe you should, too. 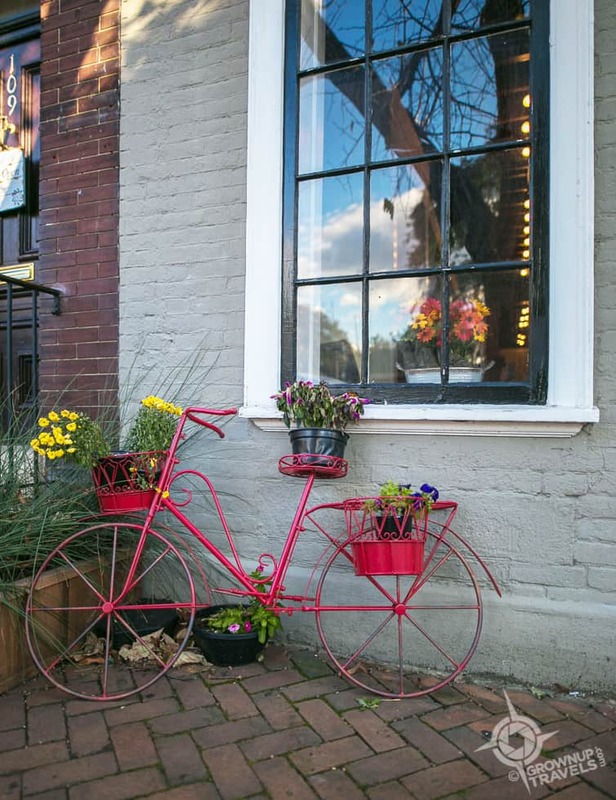 Not only does old town Alexandria deliver authentic charm around every corner, it’s about as romantic a destination as you could imagine. I know Henk and I were smitten. 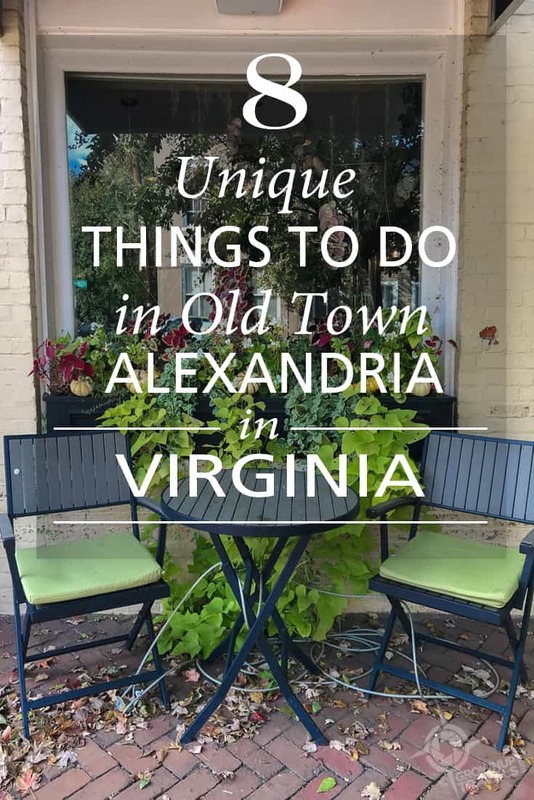 Special thanks to the office of Visit Alexandria tourism who hosted Henk and I and introduced us to the charms of this Northern Virginia city. I always enjoy visiting Virginia — so charming and so much history. I haven’t been to Alexandria yet, but it looks and sound amazing. I think a road trip is in order! I love quirky historic towns. And I like the idea that it’s easy to stay in Alexandria and take day trips to Washington. I’ve heard about how beautiful Alexandria us. Now I know the reasons why. Hope one can go inside those narrow houses! 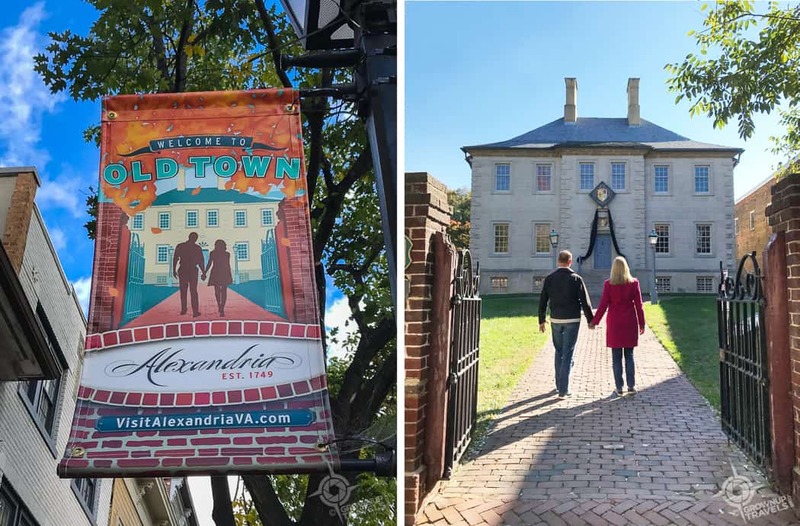 I love Alexandria and it’s always a fun day trip from DC. Nice to revisit through your pictures. 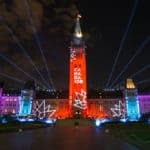 I’ve never spent the night there though, but that would be fun. 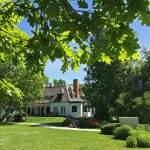 Note that the houses go back to the REVOLUTIONARY War, which was long before the Civil War. 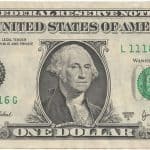 George Washington wasn’t around for the Civil War. Alexandria looks such an interesting place to visit and very Instaworthy! I loved the history, could almost have been in England. The tiny houses are quaint and interesting – funny how your arms could almost span one of them! 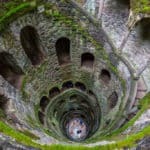 Your photos are so compelling. The visit to Alexandria does look like it was charming. Thanks for sharing.